It’s Shakespeare’s birthday. Readers of my novels will know that Shakespeare finds himself in my stories from time to time. 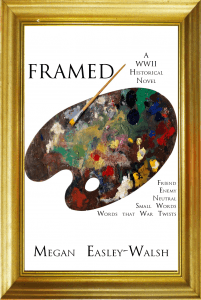 In Framed, my eighth historical novel launching around the world tomorrow, Shakespeare enters in the form of stories that Anna shares with a very special pen pal in the midst of World War Two. Anna is an art teacher in Switzerland and writes to Florent, a twelve-year-old boy in Belgium. He asks her to write a story with him. Its inspiration is Shakespeare… but there’s a fun animal twist. Anna’s letters with Florent offer reprieve from the urgent business that the war demands of her. Though she is in Switzerland, and thus neutral, her heart is anything but. Her mother is German. Her friends are Jewish. In short, her life is complicated. When a friend asks her to embark on a secret mission, the complications only increase. But, really, Anna has no choice. Everyone she loves, everything she cherishes hinges on her bravery. “Everything” also happens to include freedom of expression and art. Anna’s adventures launch around the world tomorrow. I hope you’ll love it! Framed launches around the world tomorrow in hardcover, paperback, and Kindle. The Kindle version can be pre-ordered here. Framed launches around the world today!